The Elizabethan Inn-yards were a fore-runner to Elizabethan Theatres - such as the Globe Theatre. Elizabethan Inns were always popular. Not only did they provide alcohol but they also provided rooms and lodgings for the Elizabethan traveller. The above picture of the White Hart Inn-yard illustrates a typical inn-yard detailing the courtyard and the balconies and rooms. Travelling minstrels and troubadours often entertained in these inns. Elizabethan acting troupes travelled the country and sought lodgings at inns or taverns and before long entrepreneurs, like James Burbage, started to produce plays at inn-yards - a popular and profitable idea. Burbage would negotiate with the tavern owner, or vintner, in order to stage a performance at the inn. The plays attracted more customers so everyone shared in the profit. During the Elizabethan era the usual form of transport was on horseback, so all of the major inns had large cobblestone yards. A large number of these inns were located in the capital of England in London, the centre of Elizabethan trade. The courtyards of these inns were where the first plays in England were performed - and the name 'inn-yard' was born. Alternative venues were in the houses of noblemen, town squares or, in extreme circumstances, just on open ground - especially at local fairs. An additional fee was added on if they wanted to go up to a balcony level. The London Inn-Yards were restricted and 'The Theatre' is born. 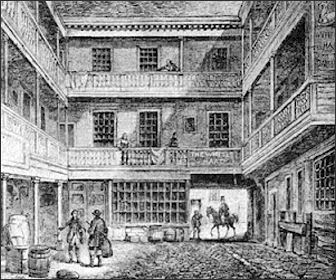 The activities at the London Inn-yards had been restricted and this caused considerable concern to James Burbage who was making a considerable amount of money from the plays being performed at the London Inn-yards. This, no doubt, prompted him to make the decision to create a purpose built building designed specifically to produce plays. He achieved his goal in 1576 by building 'The Theatre' in Finsbury Fields, Shoreditch, London. It was designed in the style of a Roman open-air amphitheatre, with three tiers of galleries and a covered stage. 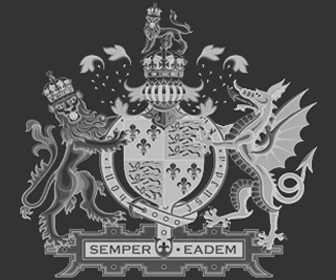 It was prudently built outside the boundary of the City of London Wall - and out of the clutches of the City of London Officials. 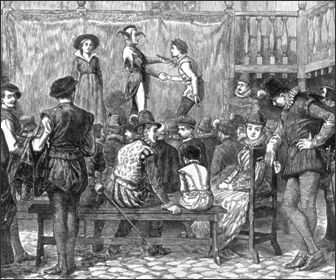 The Inn-yards were the first venues for performing Elizabethan plays and are therefore extremely important to the history of the Globe Theatre.